Bring together unsweetened applesauce and JELL-O Raspberry Flavor Gelatin in these JELL-O® bars. 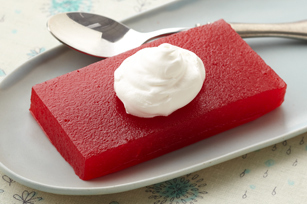 These Raspberry-Applesauce JELL-O® Bars serve eight. Add boiling water to gelatin mixes in medium bowl; stir 2 min. until completely dissolved. Stir in applesauce. Pour into 8-inch square dish sprayed with cooking spray. Serve topped with thawed COOL WHIP LITE Whipped Topping.